Darling Homes is introducing a new collection of homes that will allow Houston homebuyers to mix and match their favorite floor plan levels into new three- and four-story stackable homes. 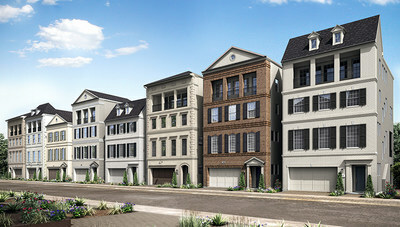 HOUSTON, Jan. 15, 2019 /PRNewswire/ -- Darling Homes is introducing a new collection of homes that will allow buyers to mix and match their favorite floor plan levels into new three- and four-story homes at Somerset Green in Houston's Inner Loop. The new concept, informed by the builder's extensive consumer research, provides Houston homebuyers with the unheard-of opportunity to select from a series of single floor layouts, stacking them to create their ideal home design. The homes come equipped with elevator shafts (elevator optional), outdoor living spaces, generous storage options as well as access to Somerset Green amenities like an on-site pool with entertainment area, dog parks and more. "It's a unique concept for us and one that Houston homebuyers should find appealing," said Amy Rino, division president for both Darling Homes and Taylor Morrison in Houston. "It gives them an opportunity to pair up their favorite layouts into one single family home. And the location is pretty difficult to beat." The location is important for both homebuyers and Darling Homes. It's the first time the builder has built a community within the loop, giving them access to homebuyers who prefer the urban setting and ease with which they can navigate the vibrant downtown Houston area. The community offers quick access to both I-10 and the I-610. That location means Somerset Green is next to some of Houston's most desirable destinations including Memorial Park, Washington Corridor, the Heights, Buffalo Bayou Park, the Galleria and Uptown Park, the Energy Corridor and downtown Houston. "It's close to everything, which is important for homebuyers in our market," Rino said. "Yet even with the urban setting, you get a sense and feel of living in your own private enclave." Part of that feeling is derived from the community's gated layout, with manned access during the day. In addition, the homes are detached, with no shared walls and two, three and four-car garages available. An optional fourth floor, fully covered outdoor space adds to the charm. Expected to start from the low $700,000s, the low-maintenance homes will offer from approximately 2,600 square feet to more than 3,000 square feet of Darling luxury with 2 to 5 bedrooms (including large master suites), up to 3 full baths (with multiple half baths available), 5 elevations and up to 4-car garages with storage. Pre-sales will begin in early 2019, with a model home following in the spring. "We will have homes ready for move-in from the very beginning of this community," Rino said. "Our feeling was why wait to offer buying opportunities when we can create some of the best optioned homes first and offer them immediately." For more information, please call (713) 401-2008 or visit https://www.darlinghomes.com/new-homes/texas/houston/houston/somerset-green-community.